Sequels are special. On the one hand, they still must follow all the same basic rules of good storytelling. But on the other hand, they both simplify and complicate various aspects of that approach. While the burden of introducing important elements (characters, settings, conflicts) is often lessened, the stakes will be raised in bringing greater depth to the existing story without allowing it to become repetitious. Nowhere is that more important—or challenging—than in the First Act in your sequel. Opening with a “first domino” event. Creating a suitable Call to Adventure (and refusal) in the Inciting Event. Building up to the First Plot Point. Pacing all the above so it’s neither too slow, nor too frenetic. That’s quite a checklist. The First Act in your sequel must still accomplish all of that. But the good news is that, because the foundation for at least the first five items was already laid in the first story, you get to focus a little less on introductory stuff and a little more on creating awesome hooks. This only works if you’re taking advantage of everything you already know about your story—and kicking it up to the next notch. Welcome to Part 15 of our ongoing series exploring the highs and lows of the Marvel Cinematic Universe. 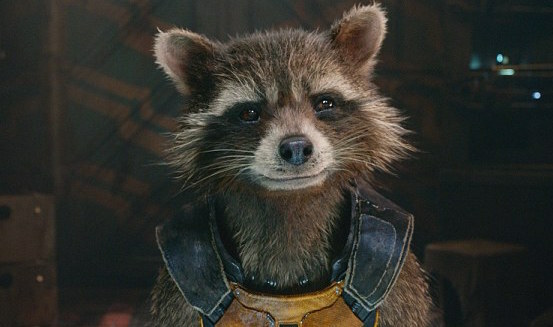 After Guardians of the Galaxy shocked everyone a few years ago with how good its rompy brand of space humor turned out to be, its follow-up to the original Awesome Mix was going to have to be very, very good to keep up. As with many sequels, it’s a bag of trail mix—but, happily, there’s more M&Ms in there than raisins. It’s funny—and in the best way, with character-centric humor that ultimately urges us to love this ragtag bunch of sentients rather than despise them (as so much of modern humor is apt to do). Trying to chart the structure in the theater (without a clock) was kind of like somebody shooting confetti in my face. Which is to say: I honestly can’t say, after one watch, how well the structure holds up. Sometimes complicated is good, sometimes not. In light of the fact that the story does wobble about a bit with protagonist Peter Quill being something less than active in the Second Act, my first reaction is that we’re seeing the latter here. But I’ll have to wait for VOD to finish its structural analysis and add it to the Story Structure Database. Awesome Mix, Vol. 2, was indeed awesome—perhaps even better and more apt than the original’s soundtrack. In writing this series, my approach in deciding whether a movie will be about a “writing do” or a “writing do not” is largely dependent on whether or not I liked the movie. Vol. 2 is not a perfect movie, and I could probably have done a post about that laggy Second Act. But, at the end of the day, I enjoyed it, as I think most people did. And that enjoyment all started with a slam-bang opening in its First Act. The reason these are so tricky is they pretty much have to happen all at the same time in your opening scene. Come up with a great Hook? Yeah, no problem. But come up with a Hook that is also the first domino in your plot that also introduces prominent characters, their relationships to the conflict, and their thematic orientations? Totally why authors end up emotionally eating all the M&Ms out of their trail mix. I’ll be honest with you: there’s no secret sauce here. Every story is different. The perfect combo that works for Guardians isn’t going to work for Captain America, and what’s for Cap isn’t going to work for my story or yours. But in identifying how other stories balance this trifecta of a perfect opening, we can learn how to find exactly the right elements for our own openings. Doing so may be a little easier in a sequel, since with the burden of introduction lifted a little, you’re freer to focus on being awesome. But don’t be fooled: this very opportunity for awesomeness means you’re under that much more pressure to fulfill it. 1. What’s the Hook in Your Sequel’s First Act? The Hook is the first structural moment in your story. It starts everything off by grabbing readers’ attention. Since we’re studying the action genre here, you might think the obvious way to do this is simply to blow something up (which Vol. 2 does). But not so much. Explosions—or anything high-octane—aren’t so interesting in themselves. The only way to capture your readers’ interest is to surprise them, even if it’s just a little. The foundation of this surprise is juxtaposition. Take two varied elements that don’t quite go together and mix them all up. This was a dream. That was the entirely obvious explanation. Except Chris Redston hadn’t dreamed in three years. This is why the technique of opening in medias res (or, in the middle of things) is so popular. When readers encounter characters after their adventure has already started, authors have the opportunity to hook readers’ curiosity by making them wonder how the characters got here to begin with. Granted, this technique is often abused and overused. You can’t just open in the middle of the explosion. Even in a sequel, you must ground readers enough to remind them why they care what happens to these characters. What is it that makes something entertaining? It’s surprise. It’s juxtaposition. It’s the unexpected (even when it is kinda expected). The First Act in your sequel gives you an unparalleled opportunity to revisit the material from your first book, but to riff on it in a slightly different way. You can tap readers’ nostalgia for and love of the first book, while steering them around the corner into the newness of this second installment. Take a moment to consider what you believe readers enjoyed most about your characters, plot, and the general tenor in the first book. How can you give them a second helping of that in the first chapter of your sequel—but in a way that expands upon the existing material? In the first book, you likely couldn’t bring all your big guns onto the screen right in the first chapter. But in the sequel, you can. When readers or viewers embark on sequel, they’re usually excited, but a little unsure. How will this story measure up to the first one? It’s the writer’s job to create an opening Hook that promises fans they’re back in good hands. Vol. 2does this in spades by opening in medias res with the Guardians up their elbows in galaxy-saving work (and alien entrails), just as expected. 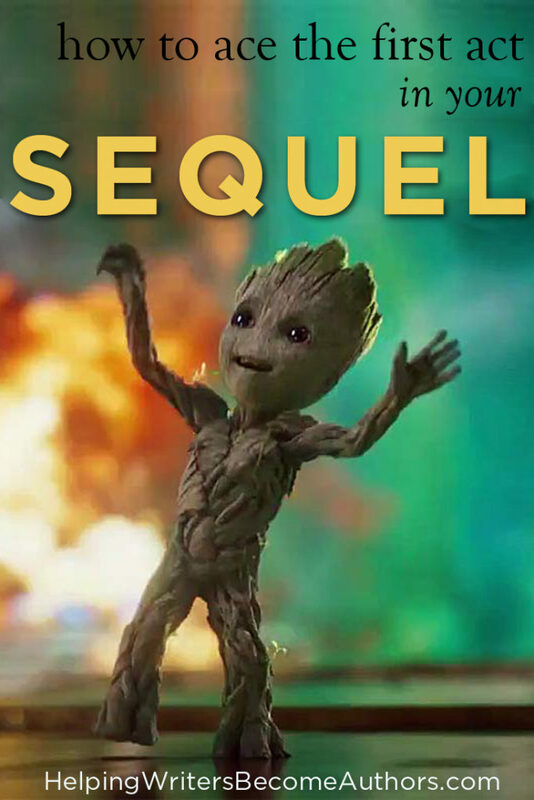 But instead of simply throwing readers into yet another opening battle montage, the film approaches its Hook through the creative portal of its predecessor and gives us an immediately grin-inducing opening sequence, in which Baby Groot dances obliviously and joyously to “Mr. Blue Sky,” through life-threatening chaos in a way that cleverly gives each of the primary characters a one-line characteristic moment. 2. What’s the Plot’s “First Domino” in Your Sequel’s First Act? Now it’s time to complicate things. Not only must your opening scene entertain readers by both reminding them of everything they loved about the first book and piquing their curiosity about this new story—you also have to kick off the plot. It’s important to remember that within the structural framework, the characters will progressively immerse themselves in the main conflict. Full immersion (i.e., inextricable immersion) won’t happen until the First Plot Point at the end of the First Act (25% of the way through your story). The character’s first distinct impact with the main conflict doesn’t happen until halfway through the First Act at the Inciting Event (the Call to Adventure that occurs here is basically the universe smacking the hero upside the head and saying: “Hey, this is what’s happening here—you gonna play or not?”). So if the main conflict doesn’t come into view until the Inciting Event, how can you introduce that conflict in the Hook? What is the fundamental Thing the Protagonist Wants? How will this spark a specific plot goal (which will be opposed by the conflict, first in the Inciting Event, then definitively in the First Plot Point)? What does the antagonist want (if he’s a human)? How will the antagonistic force (human or not) present obstacles to your character’s plot goal? What events will lead the protagonist and the antagonistic force to intersect and roadblock each other? Vol. 2 encapsulates its Hook in the opening battle, via the neat little trick of creating what is, essentially, a standalone episode at the beginning of its story. This allows the story to hook readers while still giving itself space to get its “plot feet” under itself. Note, however, that this opening episode is not a prologue. Even though it presents its own tidy little narrative (which opens in medias res and basically ties off what amounts to a previous plot goal/conflict/outcome), it leads directly into the main conflict—via Rocket’s needlessly stealing the “Harbulary” batteries and angering the Sovereign into pursuing and attacking Peter’s ship the Milano (which leads right into the Inciting Event, in which Ego saves them). 3. What Characters, Conflicts, and Themes Need to Be Introduced in Your Sequel’s First Act? The First Act is the bookend to your Third Act. Whatever important elements will come together to create the final confrontation—within both the inner and outer conflicts—in your story’s Climax, they must be introduced here. That can be a tall order, since finding creative seamless ways to introduce a large cast can easily become an exercise in clunkiness. Sowing these important elements seamlessly into your First Act requires forethought and attention. Optimally, you want to create early scenes that allow you to organically introduce, or at least foreshadow, all important elements. Not everything, of course, needs to appear in the first chapter, but it’s best if you can at least give them a nod before the Inciting Event. The first half of your First Act is all about setup, so the second half can then focus on the build-up to the First Plot Point. Start by introducing your characters—everything else flows from them. Ideally, you should be able to discover characteristic moments (either via an action or a line of dialogue) that show readers who these people are in ways that are entertaining enough to be Hooks, in themselves, while also introducing the plot via these characters’ desires, goals, and ability to present obstacles to one another. The great news in a sequel is that you’re not really introducing these people. You’re just reminding readers who they are—which gives you even greater leeway for characterization. You don’t have to run through a whole long list of who these characters are within their worlds (as, in for example, Tony Stark’s excellent introduction in Iron Man), but rather just hit upon their single greatest defining characteristic (as, for example, demonstrated in Tony’s grand entrance to the Stark Expo in Iron Man 2). Peter trying and largely failing to mother-hen everyone into following his half-baked plans. Rocket fiddling with gadgets and complaining about everything. Drax refusing to cooperate and wear his safety gear. Baby Groot speaking in monosyllables and picking fights with lizards. Gamora demonstrating wry practicality in focusing on the job at hand and using the appropriate tools (gun vs. sword). Inherent in all of this are the desires and thematic underpinnings that will be further developed as the First Act continues. Although you could open a standalone or first story with these exact same characteristic moments, they would lack the subtextual depth they offer here, thanks to our existing familiarity with the characters. And, by the same token, had the filmmakers chosen to rehash all the characters’ roles and identities, they would have missed out on the prime opportunity of a sequel—to dive deeper into expanding and developing their cast. Most of these principles hold true in any type of story. But particularly in the First Act in your sequel, make sure you’re taking full advantage of the groundwork you’ve already laid in your previous book. Much of your hard work in hooking readers with these characters is already done. Now you get to reap that labor by creating even stronger and better openings!